Commissioners agree to supply automated trash project with up to $100,000 for one year. SAN DIEGO — A one-year pilot program proposing to remove marine debris from the Port of San Diego’s waters earned the support of the port district’s Board of Port Commissioners, Jan. 9. Commissioners specifically approved a resolution to fund Zephyr Debris Removal’s one-year pilot program for up to $100,000. 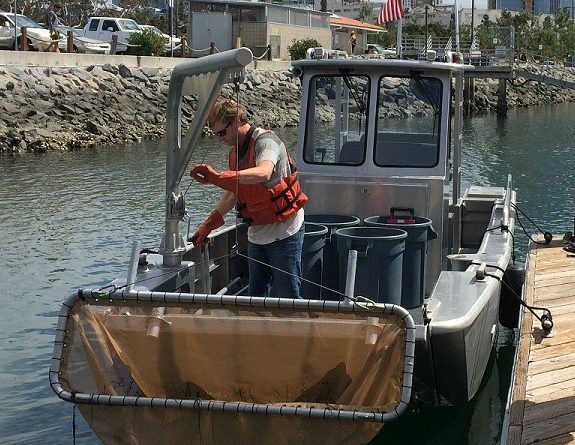 The marine debris vessel is one of four pilot project proposals for the Port of San Diego’s “blue economy” incubator, which were approved by the Board of Port Commissioners. The other proposals approved by the port district, as part of it second round of consideration, will focus on the development of oil sensor technology, an ocean monitoring platform and offshore aquaculture infrastructure. Blue economy projects focus on aquaculture-themed ventures. “We’re environmental stewards,” Commissioner Dan Malcolm said, expressing his support in the port district’s pursuit of various blue economy initiatives. Malcolm added the pilot projects would also be good investments for the port district, as funding proposals for marine debris removal, boat washes and ocean monitoring would benefit the local environment while also yielding profitable returns. “It’s the right thing to do. I think more governmental agencies should be doing the kinds of things that we’re doing,” Malcolm said. The Port of San Diego is currently home to four ongoing blue economy projects already underway: an oyster nursery known as Floating Upweller System or “FLUPSY,” copper remediation, drive-in boat wash and a smart marina app. Similar blue economy initiatives in place at the Port of Rotterdam in The Netherlands, Port of Seattle, Humboldt Bay Harbor in Northern California, Port of Ventura and Port of Los Angeles, according to port district staff. Philippe LeBlanc, the port district’s blue technology program manager, said Port of San Diego plays an instrumental role in fostering innovation and cultivating opportunities in the blue economy space. “Ports are indeed at the forefront of challenges and opportunities of a growing blue economy and uniquely positioned to play a leadership role to support ocean entrepreneurs who are developing sustainable aquaculture and blue tech businesses,” LeBlanc told commissioners. The port generally partners with organizations such as NOAA, Scripps, The Maritime Alliance, CleanTech San Diego and UCSD in pursuing blue economy initiatives. FLUPSY, the recently approved oyster nursery, recently launched its five-year pilot project near Tuna Harbor and is expected to produce as many as 4 million oysters in its first run. The nursery’s annual capacity is expected to be 20 million oysters. A drive-in boat wash developed by Rentunder is also on the clock, according to port district staff. The 2-year pilot project would demonstrate innovative technology for in-water hull cleaning, LeBlanc told commissioners. Water quality testing and monitoring will also be conducted as part of the project. Red Lion, meanwhile, will be conducting a one-year pilot project to demonstrate innovative technology for copper remediation. The project, specifically, would capture dissolved copper released during in-water boat hull cleanings. LeBlanc also highlights a mobile application for local marinas, developed by Swell Advantage as part of its pilot program. The app would, according to LeBlanc, “automate and optimize the management of the marina,” specifically help managers with slip allocation and boater communications. Board Chair Rafael Castellanos also formed an ad hoc committee to review medium- and long-range plans for the port district’s blue economy initiatives; Commissioners Ann Moore, Dan Malcolm and Marshall Merrifield were added to the committee.